I’ve been trying to grow some herbs lately, but have run into some environmental issues I think. planting the seeds was no problem. 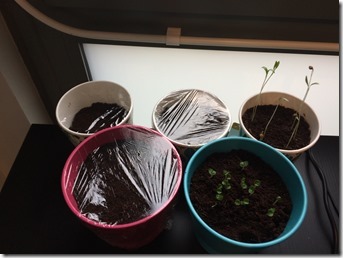 (The pink pot and the small to the right are Coriander, the blue is basil, the film is to create the “green house effect” to encourage sprouting). after they started sprouting (2-3 days for the basil and 4-5 days for the coriander) I removed the cling film. now, that’s when the odd stuff started happening. The basil plants grew to about 3cm in 3-4 days, then they stopped growing completely. After a week, they are still the same height. the coriander is even more strange, it started growing straight up like there was no tomorrow. Instead of growing more leaves as it gets slowly bigger after sprouting like it’s supposed to it kept the 2 leaves and grew to about 10-15cm in about 3 days before slowing down. The stem is very thin, so it’s a bit wobbly, but since the seeds are dug deep and the roots probably goes down a bit, I doubt they will tip over any time soon. The coriander in the pink pot have just started sprouting, so the cover stays on a little longer.